Discussion in 'Online Games - News and Reviews' started by Marina, Apr 22, 2014. Net Entertainment has done it again with the release of Aliens™ online video slot. The video slot is based on the science fiction action film from the original movie that came out in 1986 called Aliens, but it all started in 1979 with the original movie; Alien. As the sequels progressed, more and more people became followers of the Alien brand and the term sci-fi cult fits them to a tee. The movie was a blockbuster and has developed a following to this day. It was directed by James Cameron, who also directed the blockbuster Titanic and it's star was Sigourney Weaver as Ellen Ripley. It was an outbreak role for Sigourney that put her on the map to stardom. Spin your way into science fiction with this innovative 3D based graphic video slot from NetEnt. Watch the introduction and have the hairs on your head standing tall. Besides, the 3D graphics, the sounds are outstanding. It captures elements from the original movie that include; The Search, The Encounter and The Hive. Players play through three game levels and you can play with multipliers up to 14x's in one level and a possibility of 240x the bet in another level. You will be enthralled with Aliens™. It's gross. It's gruesome and the horror will have you coming back for more. 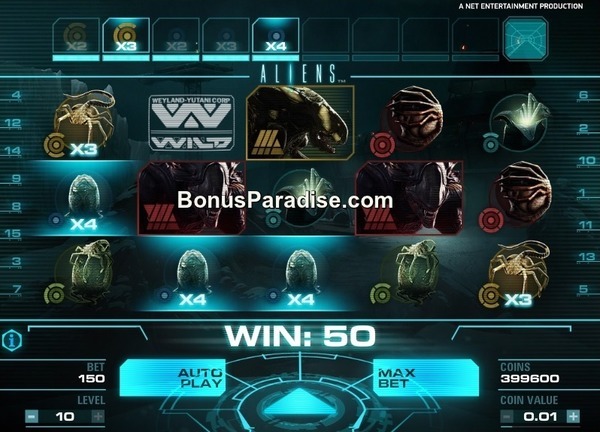 Aliens™ online video slot has 15 paylines across 5 reels and uses 3 rows. Players have their choice of level of bet which could be 1 to 10 coins. You can also choose the number of coins to place per spin. Depending on your level and coins played, the total bet for each spin could vary. Remember, the higher the bet, the bigger the wins. The video slot game interface is easy to maneuver. + and - signs for your choice of bet level and number of coins. There is also an autoplay button and a maximum bet button. Above the bet button is an "I". Players may click on that to get all the game information. All wins pay left to right. There are 3 game levels that the player achieves; Level one is The Search. Level two is The Encounter and level three is The Hive. Each level has specific values that will be mentioned in detail below. Winning symbols include red Alien, gold Alien, lime Alien, aqua Alien, blue Alien, along with red, gold, lime, aqua and blue creatures. The Wild symbol is huge W and appears throughout the game on various paylines depending on which game level you are on. on any reel and will substitute for all symbols except the overlay Ammo Clip reel. Time to search out the Aliens. In level one which is The Search, for every winning payline, that symbol appears in the Alien Activity Meter and increases the win by 1x. The aim is to fill the multiplier to the maximum level. Should you have a non-winning payline, the meter decreases by one. When the Alien Activity Meter reaches capacity, you will now be taken to level two and your quest continues. Your goal is to reach the Queen Hive. All multipliers from level one are carried over. The winnings in level two could be astronomical. You shoot your way through the Aliens to winnings. But take note; once your ammunition is empty, the level is over. After a spin, an Ammo Clip reel will appear in the middle of the screen. As long as more Ammo is showing, the spins continue. There is also an Ammo clip counter that keeps track of the number of Ammo you have left. Watch that closely. damage you have done to the have. Your goal is to destroy it completely for the highest wins. There are 4 levels of destruction to get through. Players have several options for ammunition to destroy the Hive. A single grenade could do it. Again, you have an Ammo clip. You are started with 4 Ammo Clips worth 5 re-spins. The grenade has various strengths and various multipliers which will cause random damage to the Hive. Damage to the Hive is based on the multiplier from 1-10x the damage. Aim for the Queen and her Hive and you have reached success. What a fantastic online video slot from NetEnt. Aliens™ is quite unique and the bonus features are fabulous. They seem to hit quite often. VaennyTi, Mike, Kotsy and 1 other person like this.